Come join us on March 4th ! 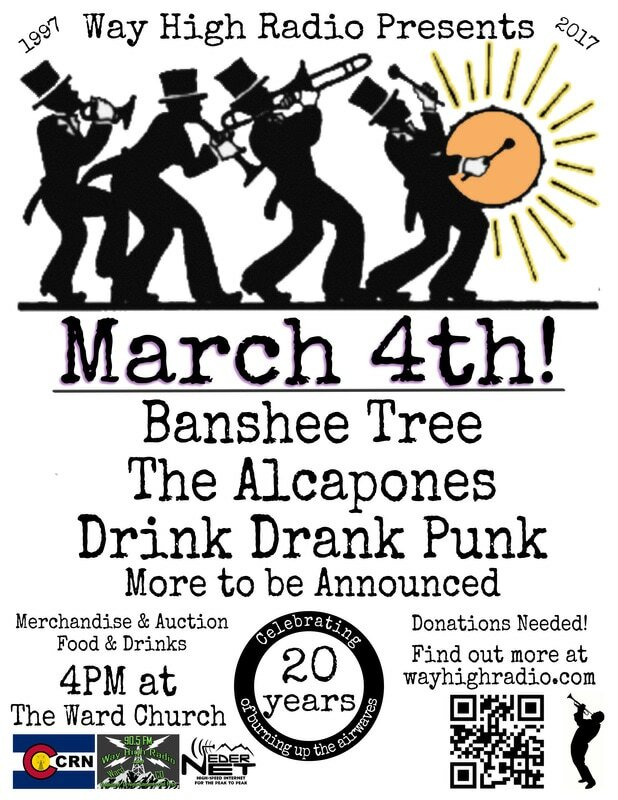 March Forth!.We're in our 20th year of operations here at Way High Radio and we're kicking it off early with a mid winter meltdown featuring Banshee Tree, Drink Drank Punk, The Alcapones and possibly more acts TBA. We’re calling the event March 4th in the theme of marching forth. It will be held on March 4th @ 4 pm, at the historic Ward Church. We'll also have our crazy live auction and silent auction, WHR merchandise and great food and drinks. There's talk of creating a make your own WHR T shirt workshop. Way High Radio merchandise will be available, along with a new T-Shirt design “The Tower of Power”. We have been wanting to do a winter event for years and this one is setting up to be a good one. The fact that this experiment in Pure Community Radio has reached 20 is pretty amazing, so we feel the need to blow our horn this year and celebrate. Last year our purpose became more solidified, when we were able to help the mountain community during the Cold Spring fire. Emergency services has been part of our charter since The Four Mile Fire. This year we plan to do at least 2 more Way High Radio Presents funraisers. We'll be finishing the year off with Hallowhen? Again, with something planned for the summer too.